CS:GO Playoffs Preview - Who will join Endpoint and Stifmeister in the Finals? With the group stage coming to a close last week; it's time to look forward to the playoffs - Starting tonight! Only two teams from these six will progress through to the Finals. 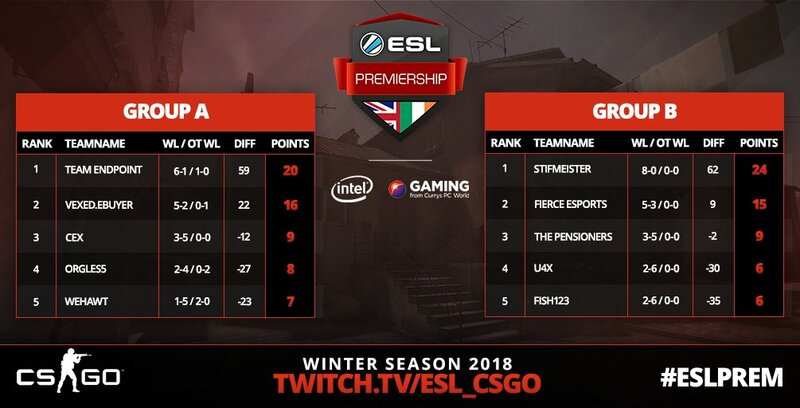 Four will be eliminated from the ESL Premiership Winter season. Both Vexed.Ebuyer and Fierce Esports will be disappointed in not reaching first place in their respective groups. Will they be able to bounce back and qualify for the finals? Or, will the other teams rise to the challenge and prove they deserve a spot in the Finals? The field is certainly open and the match-ups are too close to call. Who will qualify for the Finals? Find out tonight from 7pm, on Twitch and Mixer.